We tend to deal with peace very passively — we sit back and hope that it comes our way. But what does it look like to pursue peace? 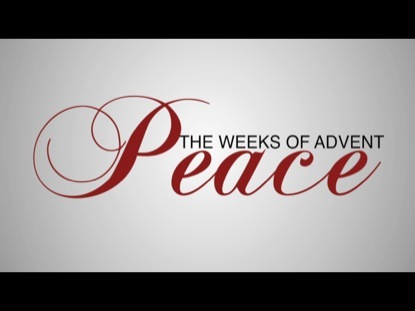 During this second week of Advent, let us all seek peace actively. Let us consider what it means to allow peace to reign in our lives as an vibrant force. Because as followers of Christ, this is what we are called to. But when he saw many Pharisees and Sadducees coming to watch him baptize, he denounced them. “You brood of snakes!” he exclaimed. “Who warned you to flee God’s coming wrath? Prove by the way you live that you have repented of your sins and turned to God. Don’t just say to each other, ‘We’re safe, for we are descendants of Abraham.’ That means nothing, for I tell you, God can create children of Abraham from these very stones. Even now the ax of God’s judgment is poised, ready to sever the roots of the trees. Yes, every tree that does not produce good fruit will be chopped down and thrown into the fire. and the land where he lives will be a glorious place. Teach me how to live a life of peace. Help me to repent and follow you only. Prepare my heart to receive him. May your grace rise like a shoot in my heart. May your harmony and peace rule in my life. with the wolf of my fears and doubts. and be the peace in me that I long for. This entry was posted in Advent and tagged Peace. Bookmark the permalink.